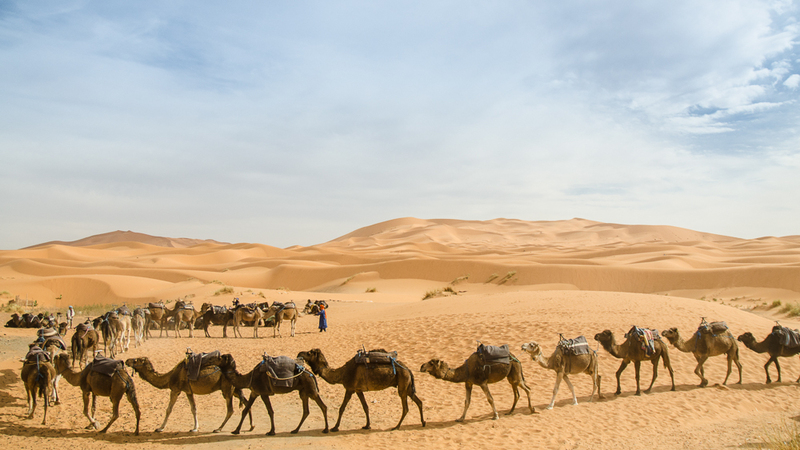 The Wandering Fools visit Morocco with G Adventures for a 19 Day Trip. 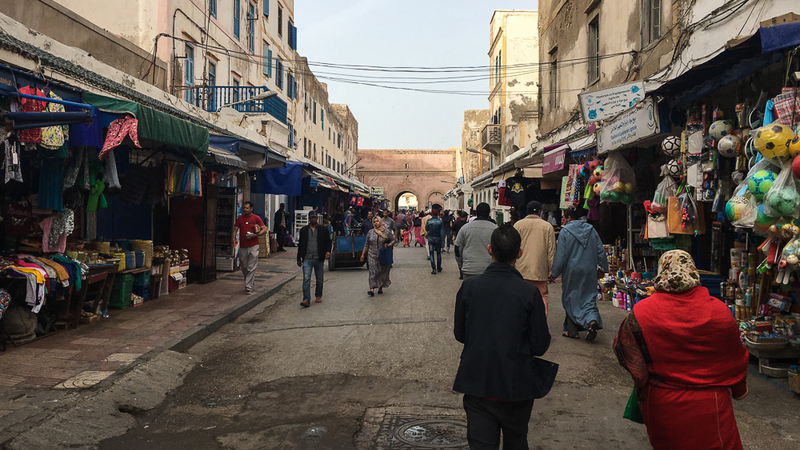 We packed light for our visit to Morocco: each of us had one daypack and one checked backpack. Our trip was to last 19 days total, 15 of which would be spent on a G Adventures tour. The other 4 days, we hoped to explore on our own. 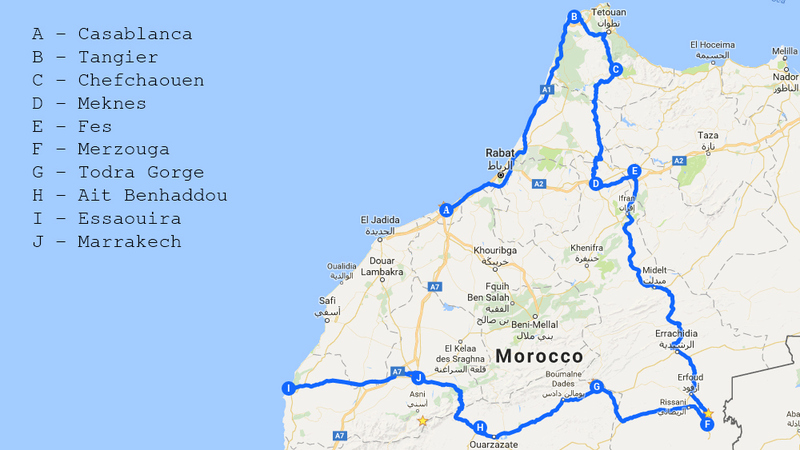 Our plan was to arrive in Casablanca in the early morning and spend a day independently exploring before meeting our tour group for a trip that would cover Tangier, Chefchaouen, Meknes, Fes, Merzouga, Todra Gorge, Ait Benhaddou, the High Atlas Mountains, Essaouira, and Marrakech. The next day, we hiked with our backpacks for 5 miles along the ocean and though the city to reach the G Adventures-designated hotel. We dropped off our luggage and made a quick stop at the Hassan II Mosque before returning to meet our travel group and tour guide and enjoy a group dinner. Determined to find another “bowl of heaven,” Mrs. Fool and I separated from the group after dinner. While walking the city streets, I bumped (accidentally, I thought) into a guy, who then apologized for bumping me. He then shook my hand, welcomed me and Mrs. Fool to Casablanca, and asked if I knew anything about soccer. As he spoke about soccer, he moved in close to me and kicked at an imaginary ball. After a few seconds, I realized something was off. I instinctively touched my front pocket, and then I grabbed his hand and asked very calmly (but with some profanity) if I could have my wallet back. With a somewhat stunned expression, the guy handed me my wallet and began to apologize. I released his arm, told him off, and then walked away, happy to have not lost a cent. That was, fortunately, the only negative encounter we would have on the entire trip with a local. The next morning we set off early in a travel bus with 13 other people from all over the world, our tour guide and bus driver. 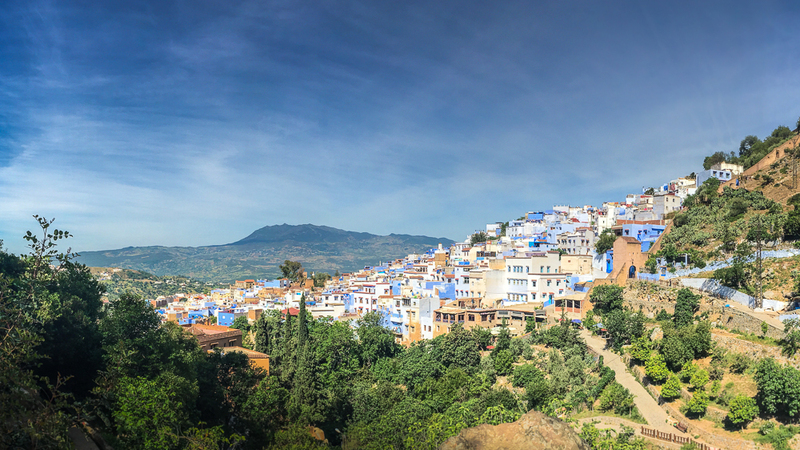 Chefchaouen, founded in 1471, is a beautiful town nestled in the foothills of Rif Mountains. We spent one evening and a full day in the town, which was hardly enough time. 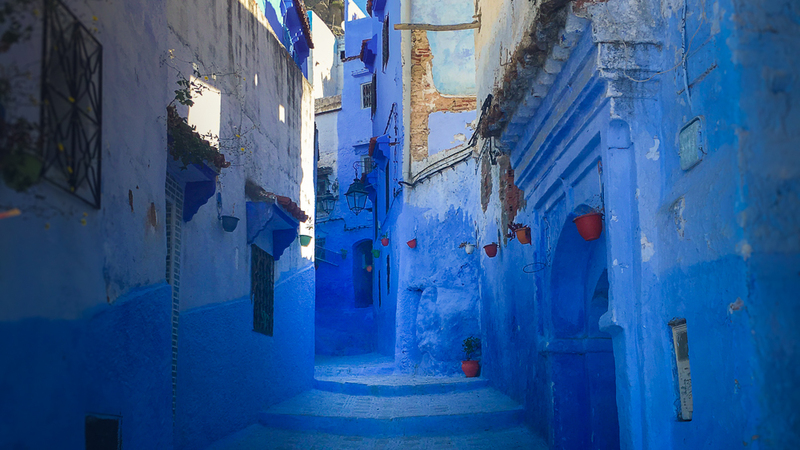 There is a maze of streets winding around the closely-packed buildings, all painted shades of blue, with open markets and street food. 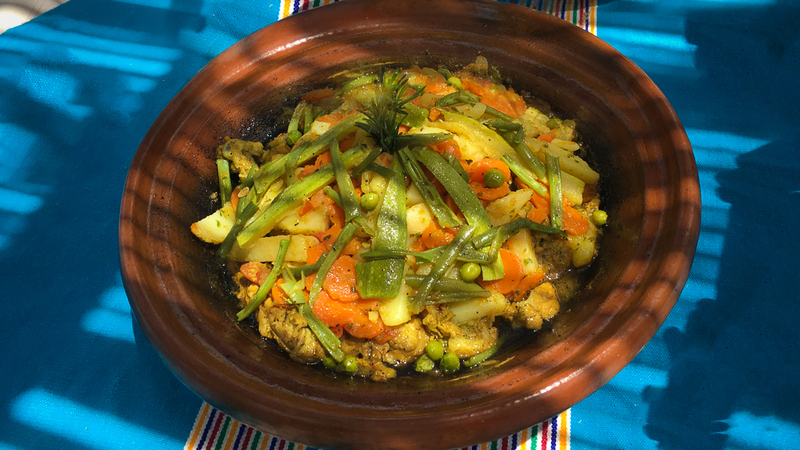 We spent a good part of the day hiking up to a Spanish mosque and then farther up into the Rif Mountains to a small farmhouse for a lunch that consisted of mint tea, bread, and chicken and vegetable tagine. A interesting thing to note is that the Rif Mountains are home to many farmers who grow marijuana plants for export. We passed vast fields of marijuana along our hike. As we got closer to Mezouga, civilization gave way to sand, and the last half hour of driving was just on sandy dirt. Our hotel was built on the edge of the Sahara Desert, one side surrounded by dense, clay-like ground and the other, sand dunes. That evening, we spent a little time swimming in the outdoor pool and then enjoyed a group dinner. 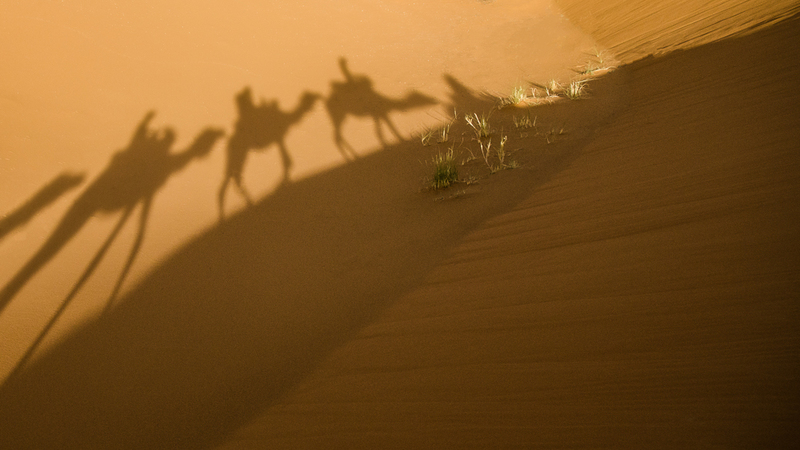 The next afternoon, we rode camels into the Sahara, snaking between towering rust-colored dunes. As the sun began to set, we all hiked up to the top of one to watch the sun sink into the sand. We then had dinner at a Beber-styled camp while listening to music and then retreated to canvas tents for the night. 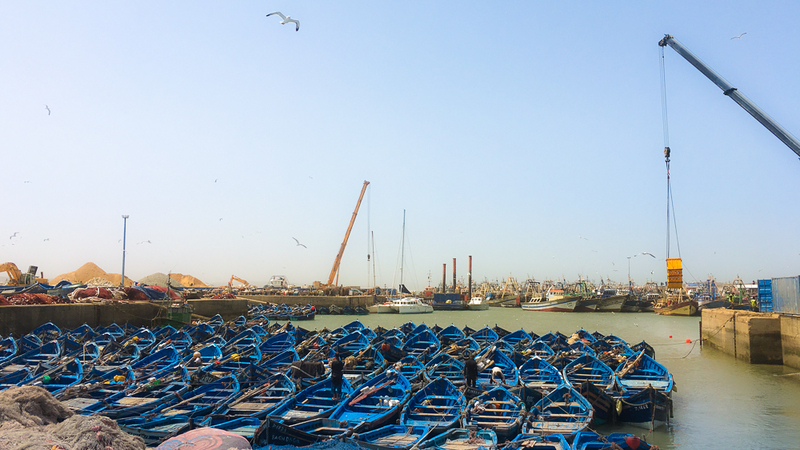 We arrived at the seaside city in the evening, and after settling in at the hotel, we explored the dozens of narrow, vendor-packed streets, looking over paintings, tasting crepes, and admiring intricately carved wooden chess boards and figurines. We paused for a half hour to dip our toes in the chilly ocean, which had very few swimmers and even fewer sunbathers. 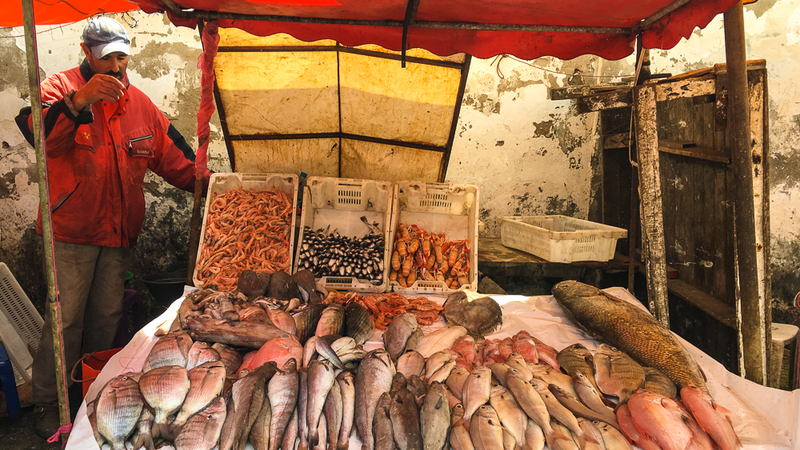 The next day, we headed to the local fish market to pick out some freshly-caught seafood. Our tour guide went to several stands, plucking up shrimp, crab, squid, and multiple types of fish. He then shepherded us across the street to a makeshift outdoor restaurant tucked between boats in the process of repair. Everyone sat in plastic chairs at folding tables, munching on bread and green olives while our fish was skillfully cleaned, filleted, and placed in thin wire baskets over charcoal grills. As each fish or mollusk was finished, it was heaped on a plate and presented to our table with a bowl of salt and slices of fresh lime for seasoning. While I dislike most seafood, Mrs. Fool happily gorged herself. 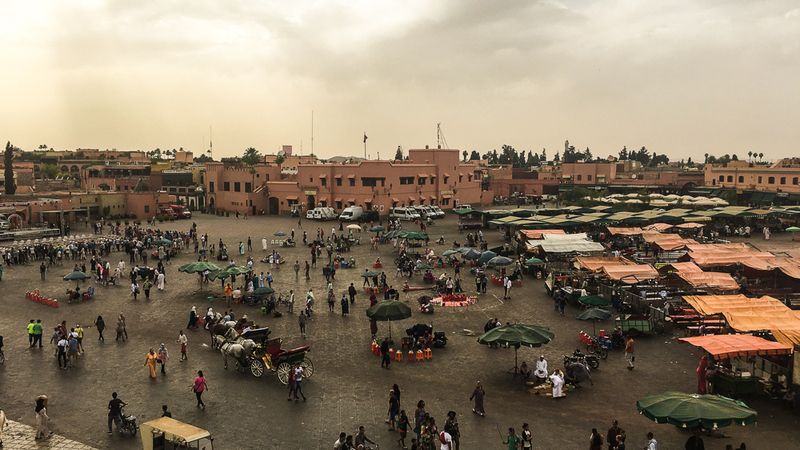 The final leg of our trip took us to Marrakech. The temperature was topping 100 degrees, but we were able to find some places that were not too hot to visit. Mind you, we’re Southern Californians who are used to scorching days, and so “too hot” is an incredibly subjective term. We spent the morning hiding in the shade of the Jardin Majorelle Botanical Gardens, and then, after an afternoon snooze, headed to Jamaa el-Fna Square to wander around the many markets and enjoy street food in the cooler evening air. The very last night, we spent inside the medina at the Riad Hotel l’Etoile d’Orient. The hotel was conveniently located to the square and very quiet. With the continued high temperatures, it was really nice to be able to explore a while and then retreat to the cool air-conditioned room. For our last dinner, we stopped at a street food vendor selling sandwiches to a crowd of hungry Moroccans. We watched as he deftly sliced open a piece of khobez and shoveled in hard boiled eggs, potatoes, and harissa. A quick drizzle of olive oil, a roll in a sheet of paper, and the package was handed to us. Simple and delicious. 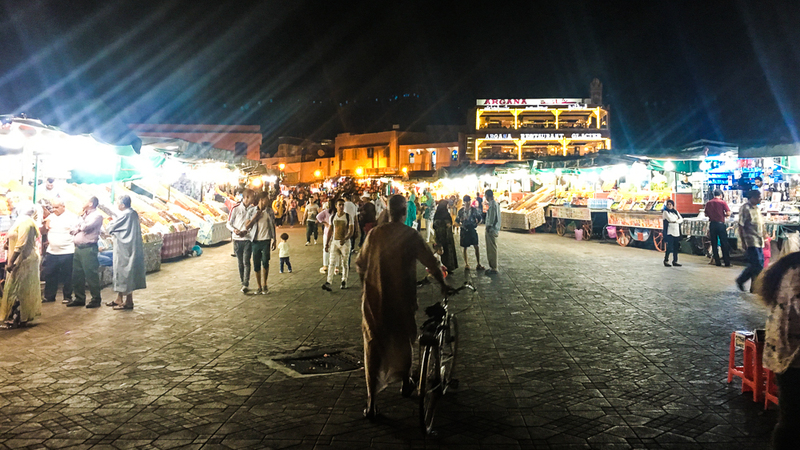 Our entire trip to Morocco lasted 17 days, and by the end, we were ready to go. 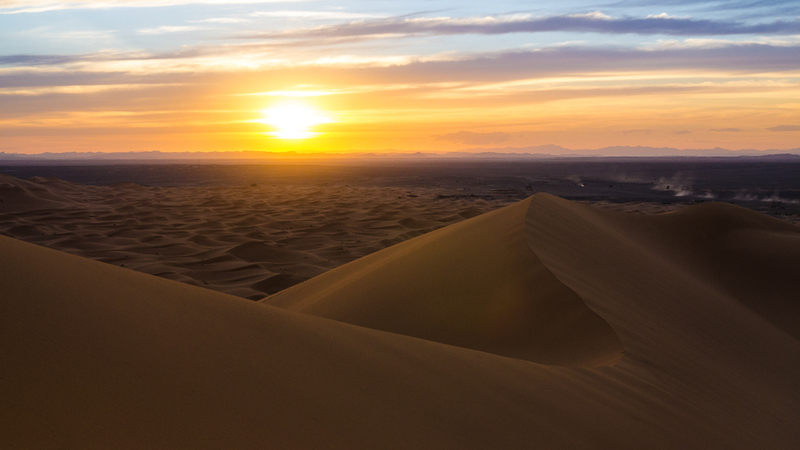 The G Adventures portion – as they cautioned on their website – was fast-paced, and the constant movement and heat (temperatures hit 105 F during a surprise heat wave) became a little tiresome by the end. We had a great tour guide, and most of the local guides were good or entertaining. We got to see and do so much that everything became a little bit of a blur. 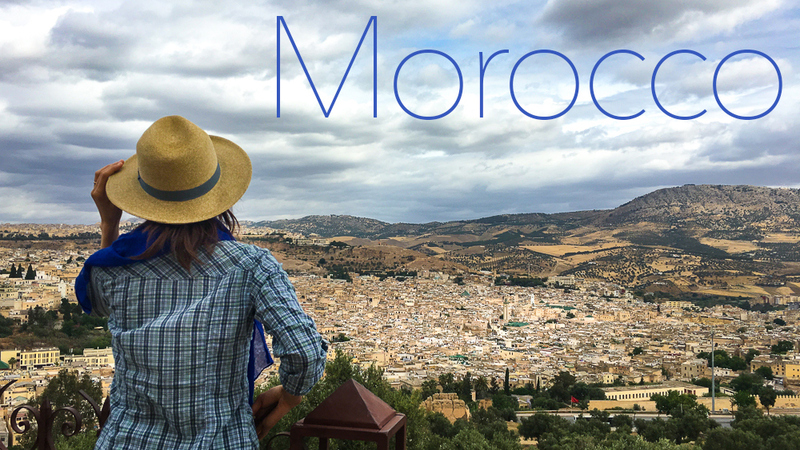 However, I think it was a great way to see Morocco. Everything was taken care of: no worrying where we would stay or how we would get from one location to another or which tour guide we should go with. We had a little bus trouble, but it was quickly resolved by our guide. Accommodations were decent, meaning don’t expect modern bathrooms, hot showers, or comfortable beds at every spot. Food was usually good, but we had some of our best meals outside of the tour when we ventured off on our own. We Fools would advise going a day early and staying a day or two at the end like we did, as it gives you a little breather on either end. The last two days were relaxing knowing we had no schedule, could sleep in, wonder the medina, browse the shops and try different restaurants at our leisure. Just about everyone on our tour got a stomach bug at some point, some worse than others. Though we played it safe – brushing our teeth with bottled water, avoiding most salads and fruits that were freshly washed – we both got a little sick midway though. So be sure to bring some Imodium or the equivalent. Beautiful photos! Sounds and looks very exotic! Pingback: The Wandering Fools visit Zürich, Switzerland on a 12 hour layover.